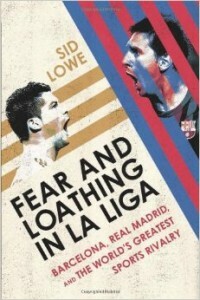 Fear and Loathing in La Liga: Barcelona, Real Madrid, and the World’s Greatest Sport Rivalry. By Sid Lowe. New York: The Nation Books, 2014. No visitor to Barcelona football club’s iconic stadium, the Camp Nou, can fail to notice the slogan splashed in huge letters across the back of the seats: mès que un club (more than a club). If one aim is to goad supporters of their archrivals, Real Madrid, it certainly seems to work. As Sid Lowe explains in his highly entertaining and exhaustive account of the rivalry between Spain’s two dominant football teams, the irritated Madrid fans have responded by inventing their own version. “Barcelona”, they chant, is “más que un puticlub” (more than a brothel). At one level, “Fear and Loathing in La Liga” is a celebration of two highly successful football clubs who, while they may inspire mutual fear and loathing, also draw plaudits and admiration from around the world. They have also attracted some of the world’s most talented footballers, many of whom crop up in this book. There is Barcelona’s powerful forward of the 1950s, the Hungarian László Kubala, whose father optimistically bought him a violin as a child, only for the youngster to use it as a goal post. Another is the Argentine star, Alfredo Di Stéfano (who some still feel was a better player than either Pele or Maradona), whom Madrid infamously stole from under the noses of Barcelona. The detailed account of Johan Cruff’s time at Barcelona clearly outlines how much the current team of Messi, Xavi, Iniesta et al owe to Cruyff and the inspirational Dutch “total football” of the 1970s. However, “Fear and Loathing” is mès que un libre about football for, in addition to being The Guardian’s Spanish football correspondent, Sid Lowe holds a PhD in modern Spanish history. He combines his areas of expertise effectively to demonstrate how the history of the two rival clubs is inextricably bound up with Spanish history itself. Just as there are fierce battles over the past and historical memory, so many of these arguments have become expressed through the tribal loyalties of football; “war minus the shooting”, as Orwell famously described it. However, it is, perhaps, no great surprise that much of the story of the rivalry between the two teams is about perception, rather than reality. Most football fans, “the twelfth man on the terraces”, are not neutral, dispassionate observers and – like everyone else – often choose to believe what they want to believe. For example, the book outlines how supporters of rival teams within Spain – and around the world – often scorn Real Madrid as “Franco’s team”. For Catalans especially, Real represents the image of traditional, Castilian, centralised power, while Barcelona is portrayed as a beacon of democracy, the symbol of the separatist movement which Franco (and by extension, Madrid) brutally suppressed. Now it is certainly true that Franco’s regime was extremely partisan towards Real; the infamous match of 1943, which ended 11-0 to Madrid, is but one example of the regime’s meddling. And Santiago Bernebeu, the father of the modern club, was quite evidently pro-Franco, having volunteered to fight for the Nationalists during the civil war. However, as the author makes clear, things are not always as simple as some would like to make out; this simplistic binary division inevitably means that inconvenient truths are ignored. In many ways this book is an exercise in myth busting; perhaps a response to some of the more trenchant (if not bizarre) opinions the author must have come across in newspapers’ online comments, or via some of his 140,000 followers on Twitter. So, for example, he points out that Rafael Sánchez Guerra, the president of Real Madrid from 1935 to 1936, was actually put on trial by the Franco regime, accused of being “a Red”. And while one of the current directors at Barcelona is allegedly a member of the right-wing Fundación Francisco Franco, the parents of Real’s former manager, Vicente del Bosque (now in charge of the Spanish national team), were imprisoned by Franco’s regime. To return to football, the author argues that “[Real] Madrid did not become the best because they were the regime’s team; they were the regime’s team because they became the best.” And it’s not as though Barcelona fans have a monopoly on feeling aggrieved: Madrid’s defeat in the 1960 European cup final still rankles, amidst rumours of bribes and dodgy English referees. Richard Baxell is a historian and IBMT Trustee. The paperback version of his latest book, “Unlikely Warriors: The British in the Spanish Civil War” was published in April this year by Aurum Press of London, priced at £12.99.